Are you an “I love to carry stuff with ease” (AKA comfort carry) kind of photographer or a “I love access to my lenses” (AKA easy access) kind of photographer? The comfort carry kinda photographers tend to take backpacks that have back systems, while the easy access types go for pouches and sling bags. When I got the Rotation360 for review I was happy to see that you can have both comfort and access in the same system. Read on for my full review. Before I get going with this review, let me share with you why this bag got my attention in the first place. I tend to hike and travel with the family quite a lot, and for each trip I must choose between either comfort or access. I can pick the comfy backpack, but then I need someone to help me switch lenses, or I can use a shoulder pack and suffer during the long trek. Dead end. The Rotation360 from ThinktankPhoto has this problem fixed. So yes, this is a backpack, but the lower part of it also doubles as a detachable pouch that can then be accessed without removing the bag from the back. It has become my new favorite bag. I’m thinking that this may also be super relevant to new photogs who have to travel quite a bit but still want easy access to their lenses. 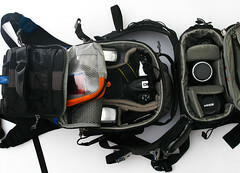 So the bag has a nice load of features – which I will review in a bit. But first and foremost, I’m gonna discuss the two main features of any bag: is it comfy? How does it handle gear storage. The bag gets a very high mark on my comfy scale. 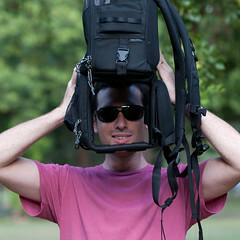 The back-system is very good comparing to other photobags I’ve used. It feels airy even after a long carry, and it has a pair of adjustable clip thingies that bring the chest straps closer together on the front – a must for my body structure. Some memory cards, batteries and other misc. All and all not too bad, considering that any stuff that goes in the bag, has to eventually be carried by yours truly. The Rotation360 is packed with features. In fact it has so many features that the guys at ThinkTank have made a video site to assist RTFM kind of guys like me in getting started. Surprisingly, almost any function comes with a strap. So there are many straps for many different kinds of functions. Some of those straps really rock. (The rotation thing will get its very own section later). Camera chest strap – a cool little strap that allows you to attach the camera to your chest – may be perfect for spinning kids shots. Additional shoulder strap – that allows you to use the pouch as a “regular” yet a bit small shoulder bag. Dividers from here to the moon – tons and tons of dividers. I ended up removing some of those dividers so I’ll have more room to gear. If you’re carrying a bunch of smaller lenses and accessories, trust me you will not be short on dividers. Rain covers – OK, those are not straps but they may come in handy when you change location under bad weather. Luckily it is midsummer here and this function has not been tested in real conditions 🙂 (thanks you lord of weather). A nice touch here is that the belt and backpack rain covers are separated. Loads of mesh pockets, small “secret” places and fun discoveries – The amount of storage pockets in the Rotation360 is amazing. If you are a compartmental freak like I am, you’re in for a treat. The rotation is actually the best feature of this bag, and as you can see there are many. Here is how it works. The bag is actually separated into two parts – a bag and a belt. The two are basically unconnected. However, just like the Constructicons can team up to build Devestator, the belt and backpack can integrate to form a full body backpack. The transformation is easy – pull a small handle on the belt and it will rotate. Now you carry “half a backpack” and a utility belt. The nice thing about the bag (and take a long hard look at the image on the left) is that the bottom half of the backpack is firm. This means that rotating the belt back in is easy. It also means that the bag sits nicely on the back even with the belt rotated or even set aside. I found that the belt can contain about three medium sized glasses. Not bad, however, if you carry a big gun, it will have to either go in the backpack or stay mounted on the camera when you’re on the move. When the belt is aligned with the backpack it stays secure using three strips of Velcro. For more control you can block the rotation function altogether, but why would you ever want to do that? – It’s the whole point of this bag. Well actually there is only one thing – making the bag a bit wider. I managed to get all I wanted into the bag, but it was a tight fit. A bit too tight for my taste. An extra inch of width would have made me feel better. In three words – I love it. It has become my daily bag if I know I’ll have to hike or change lenses a lot. For 279 USD it gives a fair fight (and wins by points) to any similar Lowpro bag.